Theater in the Now: Review: She's Back! Do we need a sequel? No. Was it worth it? Yes. Tackling one of the lesser beloved Greek plays as inspiration, Stephen Kaliski's Memoriam: After Euripedes' Alcestis sells exactly what the title says. Kaliski imagines a world where Heracles and Admetos rescue Alcestis and bring her back from the dead. Only she was perfectly fine where she was. This reimagined sequel finds Alcestis back on earth with her love. Admetos tries to get Alcesis back to normality but the task is not as easy as it seems. She goes through the motions of remembering until she turns into a bitter person that no one really knows. When the time comes for another sacrifice to be made, who's soul will be taken this time? On paper, Memoriam is a tough sell. The execution? Almost flawless. With a visionary eye from director Elizabeth Ostler, she took a script that could have been dull and lackluster and gave it life. Ostler and her creative team created a clean production that went above and beyond. Memoriam is tightly staged and stunningly designed. With variation and precision, Memoriam brought sensational lighting from Alex deNevers. deNevers found a way to introduce theatricality beyond the rep plot through Alcetis' memory suitcase light. This moment helped to elevate the play. Despite a cluttered stage, there was order. The shelves of memories were a strong choice but the moments when the text didn't correlate to the shelf placement, it was a bit of a letdown. The timelessness of the tale came through via Marisa Kaugars’ costumes. They were super light and flowy khakis and linens that created a nice vocabulary. Memoriam: After Euripides’ Alcestis would not nearly be as successful had it not be in the capable hands of Elizabeth Ostler. It calls attention to some worries in Kaliski's text. There is much repetition and fluff in his play. Even with a short pause, Memoriam dreams of being a single act saga. Additionally, the current Act 2 was a bit slower and less "fun." With both being a factor, coming back from intermission and getting back into the action was not as seamless as it could have been. Whether it was the casting or the characters themselves, the three main roles lacked the color that Kaliski found in the rest of his characters. With a structured direction that was all about precision, this ensemble moved as one. Lizzie Thompson playing Death filled her with color and ferocity. Her sly allure captured the light side of darkness. Every Greek adaptation needs a Greek Chorus and this Greek Chorus was living. The combo of Benjamin Elias Bercot, Bryce Crumlish, and Matthew Mastromatteo were a strong trio that found the balance of individuality and unity. What is guaranteed after you leave Memoriam: After Euripides’ Alcestis is that "Islands in the Stream" will get stuck in your head. At least the Feist and Constantines cover. In the right hands, Stephen Kaliski's play can go far. But it's still a tough sale. Perhaps a less daunting title could help in the future. 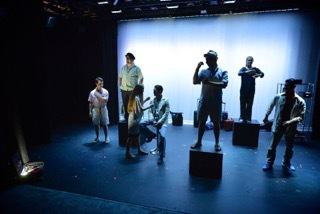 Nevertheless, if you're looking for a diamond in the rough production at FringeNYC, check out the offering from Hypnic Theatre Company and Adjusted Realists.